Based upon Tom Pocock’s account in “Horatio Nelson”, Bodley Head, 1987.
their carronades properly fitted and plenty of ammunition and pikes are to be with Admiral Nelson at half-past 8 o’clock this night for a particular service”. In Nelson’s sometimes understated way, he commented “I wish to make it a warm night at Cadiz”. The plan was to bombard the city with a mortar mounted in a bomb-vessel in the hope of provoking the Spanish fleet to make a sortie so that it could be brought to battle before further reinforcements arrived. What was unusual about the operation was that the flotilla of British boats, which were to protect the ship against the swarm of Spanish oared gunboats that would certainly come out of harbour to attack her, would not be commanded by a captain, as would be expected, but by Admiral Nelson himself. Moreover, he decided to take with him in his ten-oared barge Captain Thomas Fremantle, his friend, who was commanding the frigate Seahorse. Their boat’s crew would, like the others, be armed with pikes, pistols and cutlasses while they would wear their elegantly chased and engraved fighting swords because hand-to-hand combat was almost inevitable. John Sykes was close to Nelson on his left hand and he seemed more concerned with the Admiral’s life than with his own: he hardly ever struck a blow but to save his gallant officer. Twice he parried blows that must have been fatal to Nelson…. It was cut, thrust, fire and no load again – we had no time for that. The Spaniards fought like devils and seemed to resolve to win from the Admiral the laurels of his former victory; they appeared to know him and directed their particalar attack towards the officers. “Twice Sykes saved him; and now he saw a blow descending that would have severed the head of Nelson. In the second of thought that a cool man possesses, Sykes saw that he could not ward the blow with his cutlass…. He saw the danger; that moment expired and Nelson would have been a corpse: but Sykes saved him – he interposed his own hand ! We all saw it…. and we gave in revenge one cheer and one tremendous rally. Eighteen of the Spaniards were killed and we boarded and carried her: there being not one man left on board who was not either dead or wounded”. Nelson, supporting his bleeding coxswain, thanked him: “Sykes, I cannot forget this”. Nor did he, and it was not only Sykes’s bravery that he remembered for he was to recall without modesty that “my personal courage was more conspicuous than at any other period of my life”. He knew, too, that the story of the admiral fighting hand-to-hand alongside his sailors would spread quickly through the fleet and this was one of his reasons for taking the unnecessary risk. 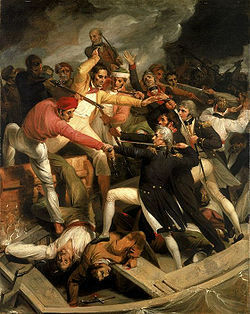 In 1797, unrest and mutiny was rising from the lower-decks. Conditions of service were bad, the sailors had had no pay increase for a century, punishments were often unjust and brutal and sick and wounded men received inadequate attention. By that time Nelson had already done enough to win the loyalty of the squadron under his command and through his action at Cadiz he hoped to impress upon them, and the fleet, that they weren’t alone in their feelings and that some senior officers, at least, were prepared to fight shoulder-to-shoulder with them. Nelson, and officers like him, took the grievances seriously and achieved much in addressing the injustices and hardships to improve the general conditions of the service.